1. How hard is video game design? It’s challenging, and also rewarding. Designing games is not the same as playing them—designing takes hard work and time. But, if you put the time and effort in, you can build games you’re proud of. 2. How do you design a video game? Video games can take many forms—anything from a text-based web browser game to a AAA console release. Designing a game starts with an idea. It’s completed with drive and time (we’re leaving out a lot of steps here!). 3. How long does it take to design a video game? The time it takes to design a video game depends on the scope of the game. Big AAA titles can take years. A simple game could take you an afternoon to build (especially if you’re well-versed in a programming language or particular game engine). 4. What programming languages do I need to know for game design? Java and C++ are common choices. If you know you want to work in Unity, C# is a good option. It depends on the kind of games you want to design and the engines you want to use, but these programming languages are a good starting point for many aspiring game designers. 5. What is a game design document? A game design document is your one-stop-shop for everything you need to know about the game you’re creating. Your team fills it with all the info you need regarding the concepts, ideas, aesthetics, mechanics, characters, plot, features, etc. that you’ll include in the game. 6. Do you need to know how to code to design video games? It can definitely help, but coding isn’t necessary to design video games (especially if you know people (or have a team) who can code. There are also game engines that let you develop games without knowing any code. 7. What is the difference between game design and development? The easiest way to think about it is this—game design is creating the main ideas of the game. It’s the creative side. Game development is turning this vision into an actual game. It’s the programming side. 8. What is the best video game engine? The “best” video game engine is whatever program best allows you to realize the vision of your game. Two of the most popular or “industry standard” engines are Unreal Engine and Unity. 1. Best FREE tools for video game design? There are free game development tools, like certain game engines, that you can take advantage of to build a game right now: Unity 3D, GameMaker: Studio, PlayCanvas, etc. But sometimes the best place to start designing a game is with paper and pencil (nearly free). 2. Best software to start with game design? It might be tempting to jump right into Unreal Engine 4 and Unity 3D (since they’re popular). But if you’re a beginner, a program like Stencyl is a manageable place to start—it’s free, manageable, and you don’t need to know any code. 3. Best tools/resources for learning game design? YouTube is an incredible resource for learning game design. There are videos covering anything you could want to know. If you’re looking to learn a specific video game engine, you could check that engine’s official blog/forums. Reddit and other online forums can yield the answers you need, too. 4. What are the best blogs for game design? Extra Credits provides pretty exhaustive information on game design in a well-explained, easy-to-digest way. Gamasutra is another all-encompassing blog, where they touch on most aspects of game design with input from industry professionals. 5. What are the best books for game design? It depends where you are in your journey, but there are few game design books that industry vets recommend over and over. These include titles like The Art of Game Design: A Book of Lenses, Challenges for Game Designers, and Game Design Workshop. 1. What are the best colleges for video game design? Not all collegiate game design programs are created equal. Some of the best colleges for video game design include University of Southern California, DigiPen Institute of Technology, and the Rochester Institute of Technology, among others. 2. Do you need a degree for game design? You do not need a degree to get into game design, though in some cases it could help. What many studios are most concerned with is your portfolio—build a great portfolio and you’ll have a much better time breaking into the industry. Related: Do You Need a Degree to Be a Game Designer? 3. Is game design school worth it? It certainly can be. As with any learning, you’ll get out of it what you put in. If you want to coast and do the bare minimum for projects, game design school will not be worth it. If you want to put serious time into advancing your craft and networking with other students and professors, it can be a life-changing opportunity. 4. What is the best way to learn video game design? If you’re disciplined, the internet has everything you need to get started with video game design. If you need extra accountability, online programs like Udemy, Animation Mentor, and others with actual instructors, assignments, and participation requirements could be helpful. In either case, the best way to learn video game design is to design video games. Look at tutorials and read the forums, then apply and practice what you learn. 5. How many years of college for game design? There are two-year certificate programs. There are 4 year Bachelor’s programs. And there are Master’s programs that usually take 1-2 years to complete. 1. Will an animation degree help with game design? Having an animation degree certainly could help, especially if you’re working on a smaller team. A small indie team might require people who can fill more roles on the project. Someone who intimately understands animation can help with aesthetic design decisions for the game and the rendering of in-game assets. 1. What makes a great game designer? The majority of people play games to have fun—to escape, to unwind, to connect with friends. The great game designers find clever ways to bring these experiences to players. 2. How to create a game design portfolio? There’s only one way to create a game design portfolio: design games! The more you create, the better you’ll become. You’ll have more material to pick from for your portfolio entries, and the time you spend will show through in your work. 3. How to become a video game tester? A relevant degree usually helps—game design or development, or computer science, for example. Quality Assurance positions are often listed online on job sites. 4. How to become a video game artist? To become a video game artist, you’ll need to prove to game studios that you have the artistic chops for the job. First, build your skills—drawing, adobe suite, Maya, 3DS Max, etc. Then, build an incredible portfolio and start applying. 5. Who are the best game design studios to work for? Pick a studio that lines up with your values and styles as a game player and a game designer. Not everyone wants to work on AAA titles, and not everyone wants to work on indie projects. Do your research and find studios you can get excited about. 6. How to get a game design internship? Game design internships can be found online, through sites like indeed.com. You can also find application details for specific studios on their respective websites. Your portfolio will play a big role in differentiating yourself, so make sure you’ve built a good one. 7. How much money do video game designers make? A quick search on a site like Glassdoor.com will show you current numbers. The average pay is around $61,000 for 0-3 years of experience. Geographic location, studio, and experience will impact this amount. 8. How hard is it to get a video game design job? It’s hard. The reality is that there are way more people (especially coming out of college) looking for game design jobs than there are jobs available. BUT there are still game design jobs available. If you’re willing to work harder than most of your peers, and you take the time to build a great portfolio, you stand a good chance of being one of the lucky few to nab a job. Related: What Does It Take to Become a Game Designer? 9. 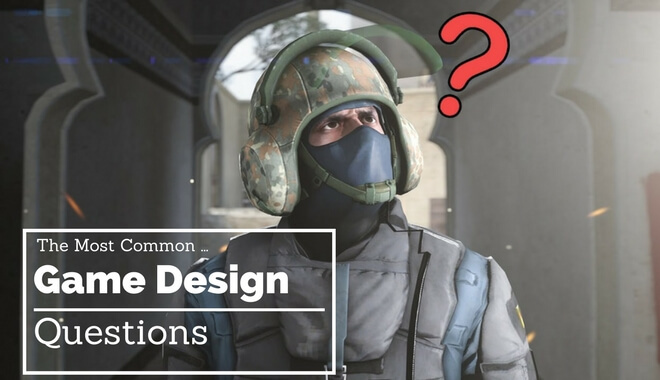 Is a career in video game design realistic? 10. How competitive is the video game design job market? It’s competitive. With the boom in colleges offering game design degrees, aspiring game designers are being churned out left and right. Supply for aspiring designers is up, but the demand for them is low. Still, there are jobs out there! 1. Are video games bad for you? No, video games are not inherently bad for you. Sitting for extended periods of time has been linked to adverse health effects. But if you stand up every so often while you play, you’ll probably be OK. And video games alone won’t make you an evil person (a la GTA scares that pop up every so often), so don’t worry about that, either. 2. How has video game design changed in the last 20 years? The game industry has thrived in recent years—it’s now a multi-billion dollar industry. Video game design has expanded to accommodate players of all ages and skill levels. With the reintroduction of virtual reality and augmented reality tech, the innovation is only just beginning.